I have 3 versions of this picture edited differently in iPhone. 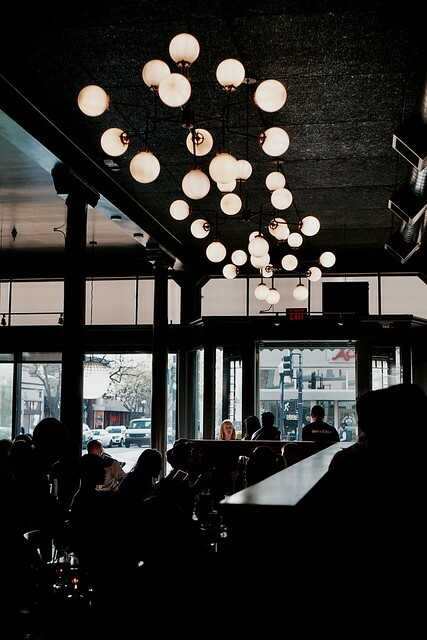 And I can't explain why I am attracted to the lighting fixtures. Picture was taken on last Thursday in a team event in Eureka on Castro in Mountain View. I had a great time with my colleagues. Wish I had edited this on Lightroom instead. The iPhone editor is amazingly easy but it lacks some complex adjustment to sharpness and tone adjustment. I shot with Sony A6000 and my new lens with Sony E 35mm f/1.8. A sweet lens to have but I prefer to shoot in 30mm, I originally want to go with Sigma Art 30mm f/1.4 but I later decide with Sony E 35mm f/1.8 instead as I plan to keep my A6000 longer and the OSS that comes with lens helps in low light and video.